Jakarta (Indonesia) – May 2, 2017 (travelindex.com) – Alain St.Ange, the Seychelles Candidate for Secretary General of the UNWTO (United Nations World Tourism Organisation) was in Bangkok during the last couple of days for the WTTC 2017 Summit. Alain St.Ange is the former Seychelles Minister for Tourism, Civil Aviation, Ports and Marine and has been calling on Tourism Ministers to seek support for the Seychelles candidacy. “This election would make history because it is the first time that Africa has a candidate who could see the Continent get through to the second round of voting and pull the seat of SG” said St.Ange who went on to spell out that the election for SG is from Global Tourism and votes are needed right across the tourism world. 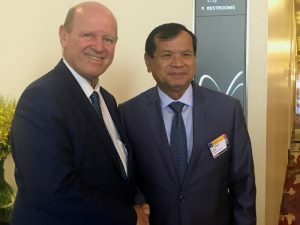 After his meeting with Tourism Minister Kobkarn Wattanavvrangkul of Thailand and with her Senior Officials as well as with Senior Officials of the Ministry of Foreign Affairs, Alain St.Ange met with Dr Thong Khon, the Minister of Tourism of Cambodia. This was not the first meeting between Minister Khon and Mr St.Ange. The Seychelles Minister participated in the UNWTO / UNESCO meeting on Tourism and Culture in Cambodia and Cambodia is one of the ASEAN countries that sent a cultural delegation to participate in the Seychelles annual Carnaval International de Victoria. Discussions at this latest meeting centred od growing the tourism cake and the coming UNWTO elections. The next stop on Alain St.Ange was Jakarta on Indonesia where he met with the press to highlight the need for a UNWTO Regional Office in the ASEAN Block as well as highlights of his Mission Statement as a UNWTO Candidate for Secretary General. Alain St.Ange also took time to speak at length on what he calls Muslim Tourism or Halal Tourism. “I chose to talk about this niche market here in Indonesia because you have the largest Muslim Population. Respecting your religion is a fundamental part of my Statement of Intent as the Seychelles Candidate. Understanding each other as people will pave the way for a more peaceful world” said St.Ange before quoting the words of President Nelson Mandela on the need to respect. “President Nelson Mandela of South Africa said:- For to be Free is not merely to cast off one’s chains, but to love in a way that respects & enhances the freedom of others. These words strengthen the Seychelles call for a tourism industry without discrimination, and respect the Muslim world falls squarely in this call” said Alain St.Ange before adding that every on of the six candidates wanting to take over as SG of UNWTO should declare publicly that they are against all forms of discrimination. St.Ange also invited the press to get hold of the Statements of Intent by each of the six candidates vying to be SG and to read it as this in itself is an eye opener. With No Program the world of tourism will just be another body with no agenda he said.